Reynolds’s ambitious, stunningly detailed Revelation Space trilogy (Revelation Space, paperback, etc.) seethes with post-human Demarchists, Ultras and Conjoiners, and alien Shrouders, Pattern Jugglers and Inhibitors. Here, two novellas share the grand setting but not characters or plot. 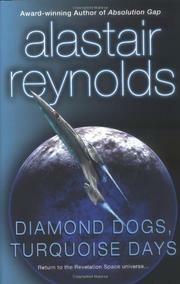 In “Diamond Dogs,” explorer Roland Childe draws in a team to explore an alien artifact on planet Golgotha, among them obsessive cybernetics expert, Dr. Trintignant, scholar Richard Swift and Richard’s ex-wife Celeste (he had his memories of her erased), who’s had her math abilities enhanced by the alien Pattern Jugglers. The artifact, a huge building called the Blood Spire, is a puzzle-palace with a succession of rooms, each opening only when a particular problem has been solved. Wrong answers are, however, punished by dismemberment or death. Those members of the team who survive are forced to allow Dr. Trintignant to transform them into cyborgs as they progress deeper and deeper into the building, toward—what? In “Turquoise Days,” the seas of planet Turquoise contain Pattern Jugglers, aggregations of microscopic life-forms that contain copies of the memories of every intelligent creature that ever swam in the ocean. The Jugglers can also impress, temporarily or permanently, the mindset of one being upon another. Researcher Naqi Okpik, whose sister Mina vanished in the ocean and whose mind is still preserved there, must defend the Jugglers against the crew of a vast light-hugger starship who want to use the Jugglers to create an army of religious-warrior fanatics—and a renegade crewman who’d rather kill the Jugglers and all the minds they contain rather than allow the fanatics to succeed. “Dogs” is certainly the stronger, though both tales are noteworthy; readers familiar with Reynolds will find intriguing sidebars, while those unacquainted should try the novels first.